After an extensive search of medical grade skincare products, Impressions MedSpa is happy to announce we are now exclusively offering Dr. Zein Obagi’s new line of ZO Skin Care. Dr. Obagi is a renowned dermatologist with an extensive history in creating remarkable skin care solutions. ZO Skin Health products take an entirely different approach to skin care, offering much more than surface-deep lotions and toners. 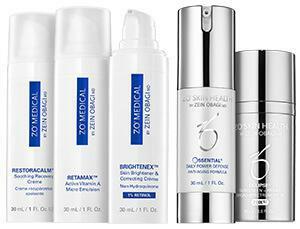 The ZO skin care line offers two categories of products: (1) Skin Health and (2) Medical. With an approach to skin as a science, ZO Skin Health products are an excellent daily skincare solution that restores skin with technologically advanced ingredients for lasting effects that go beneath the surface. 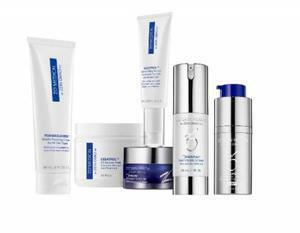 The ZO Medical line focuses on treating chronic skin disorders to improve the look and appearance of the skin over time. With a focus on the latest scientific advances in skin therapy, these skin care products work well for any skin type, regardless of age or gender. Depending on your individual skin concern and complimentary Visia skin analysis, the team at Impressions MedSpa can determine the ideal ZO Skin Health regimen that will work best for you. Gentle Cleanser is good for all skin types. This is an effective glycerin and botanical blend that gently cleanses away oil and impurities, leaving skin refreshed and hydrated. Exfoliating Cleanser is good for normal to oily skin. This is a gentle exfoliating cleanser that rids the skin of dirt and surface oils. Micro-beads exfoliate to unclog pores, while vitamin E provides antioxidant properties. Hydrating Cleanser is for those with normal to dry skin. This dual-action cleanser combines glycerin and allantoin to soothe sensitive skin, while cleansing away oil and makeup. Exfoliating Polish contains magnesium crystals that exfoliate dead skin cells to create a clear, smooth and even toned complexion. Dual-Action Scrub is a dual-action exfoliation that helps remove dead skin cells and excess surface oil that can lead to clogged pores. Complexion Renewal Pads these moistened pads help minimize surface oil and exfoliate pore-clogging dead skin cells and dirt. Oil Control Pads Acne Treatment is a product for maximum-strength acne prevention, these oil control pads are formulated with 2% salicylic acid to clear acne, minimize surface oil, and reduce the appearance of pores. Calming Toner pH Balancer is a calming, pH-balanced toner that removes impurities and invigorates weak and sensitive skin. Step 2 products address specific skincare concerns. These include products ranging from preventative daily skincare programs, which keep skin healthy and prevent future damage, to aggressive programs that target repair and restoration. Prevention programs include: aging, pigmentation, redness. Daily Power Defense is designed to diminish lines and winkles and to address future damage. This powerful antioxidant serum was designed to support the skin’s natural DNA repair process + help restore barrier function and skin health. 10% Vitamin C Self-Activating is a potent anti-aging dose of vitamin C that brightens and redefines skin, promoting a more even skin tone, and minimizing fine lines and wrinkles for a smoother complexion. Growth Factor Serum is a lightweight gel, with ZPRO® complex, that supports skin rejuvenation, reduces the appearance of expression lines and wrinkles, and protects against future signs of aging. Radical Night Repair is an anti-aging treatment, formulated with 1% retinol, improves texture and uneven pigmentation, and diminishes fine lines and wrinkles for a more youthful skin tone. Wrinkle + Texture Repair with retinol and antioxidants, supports visible improvement in texture, firmness and color tone. Refissa is a prescription-strength .05% tretinoin that helps diminish fine facial wrinkles + fade irregular pigmentation due to sun damage. Brightalive® Skin Brightener this non-retinol skin brightener is formulated to even skin tone, reduce dark spots and restore hydration, while calming and soothing irritated skin. Melamin™ Skin Bleaching & Correcting Crème contains 4% hydroquinone and glycolic acid to correct pigmentation disorders, promote even skin tones and mitigate pigment-forming irritations. Retinol Skin Brightener is a non-hydroquinone product that incorporates an effective retinol blend to reduce the appearance of uneven skin tone and age spots, plus provides antioxidant protection for a brighter skin tone. Enzymatic Peel is a rejuvenating at-home peel that soothes and hydrates your skin for a smoother texture and brighter appearance. Rozatrol is designed for red, sensitized skin, this treatment serum, with ZO-RR2™ complex, reduces excess surface oil to normalize skin, and exfoliates to prevent signs of premature aging. Exfoliation Accelerator brightens skin and unclogs pores with a glycolic and lactic acid complex that exfoliates cells while also calming skin with a soothing blend of aloe, green tea and chamomile. Step 3 offers a sun protection portfolio that offers scientifically superior sunscreens with the broadest, most comprehensive range of sun protection available. This advanced, triple-spectrum protection shields against UVA/UVB, high-energy visible (HEV) light and IR-A (infrared) rays. Sunscreen + Primer Broad-Spectrum SPF 30 is a dual-action product featuring a built-in primer that leaves a soft finish for a more even makeup application and complexion. Broad-Spectrum Sunscreen SPF 30 is ideal for even the most sensitive skin types or for those needing post-procedure protection for the face and body. Daily Sheer Broad-Spectrum Sunscreen SPF 50 is formulated for protection during outdoor activities, this sunscreen is packed with hydration, helping prevent dryness from increased outdoor exposure. Smart Tone Broad-Spectrum Sunscreen 50 is designed with customizable color beads, this sunscreen features a universal tint of color designed to match any skin tone. 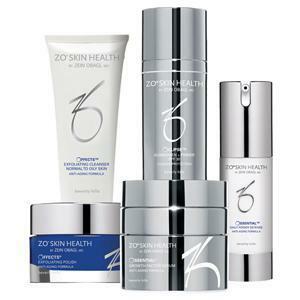 The above items are just a small sample of the products in the ZO skin care line. At Impressions MedSpa, we believe in creating a customized plan for each of our clients. The first step is a complimentary Visia® skin analysis. The Visia® analysis allows us to see not only what is on your skin, but what lies beneath the surface as well. Armed with the Visia® analysis information, we can work together to help develop a customized plan that will achieve your desired results.